Spectroscopy and dynamics of semiconductor and metal nanoparticles. Dynamics of condensed phase electron and proton transfer reactions. Ultrafast optical spectroscopy. My research focuses on condensed phase spectroscopy and dynamics. We have been particularly interested in the chemical, optical and electronic properties of semiconductor nanoparticles. Several ongoing research projects are described below. Spectroscopy and morphology of core/shell nanoparticles. Lattice mismatch play a central role in determining the morphology and the spectroscopy of core shell particles. In the present studies, we examine the role of lattice mismatch in determining the shell uniformity in core/shell nanocrystals. Surface energy—proportional to surface area and controlled by the types of surface-adsorbed ligands. Strain energy—controlled by the radial composition profile—calculated through elastic continuum theory. Shell thicknesses—determined by measuring the rate of charge tunneling through the shell. The model system we have most extensively studied is ZnTe/CdSe. This is a type-II system, similar to the extensively studied CdTe/CdSe system. However, ZnTe and CdSe have nearly identical lattice parameters. But, upon annealing, the cations diffuse and one gets a particle best described as (Zn,Cd)Te/(Cd,Zn)Se, which has a large lattice mismatch. The lattice mismatch and energetics of CdTe/CdSe and ZnTe/CdSe particles are depicted below. 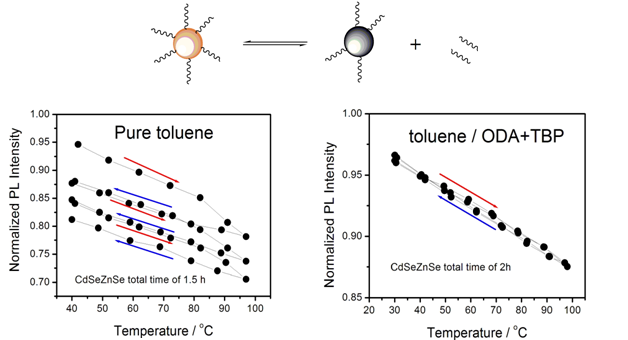 For ZnTe/CdSe zincblende nanocrystals, the we reach the following conclusions: low temperature (200 °C) shell growth → very little cation diffusion → relatively small lattice mismatch → uniform shell growth to about a thickness of three CdSe monolayers (a wetting layer), followed by island formation (Stranski-Krastanov growth). Shell annealing at 250 °C → extensive cation diffusion → larger lattice mismatch → island formation w/o wetting layer (Volmer-Weber growth). When a hole acceptor (phenothiazine) is adsorbed on the particles surface, the charge tunneling dynamics, and hence quenching kinetics are a very sensitive probe to the local shell thickness. Dramatically different hole quenching kinetics are associated with a smooth wetting layer (below, left) and Stranski-Krastanov island growth (below, right). By analyzing the luminescence decay, the shell thickness inhomogeneity (the shell surface roughness) can be obtained. The calculated curves correspond to a Poisson distribution of acceptors adsorbed on the particles at different phenothiazine concentrations. Thermal quenching is the phenomenon where the luminescence quantum yield decreases with increasing temperature. The phenomenon is typically reversible—the quantum yield returns to its previous value when you cool the sample. The use of quantum dots in many applications requires that there be little of no thermal quenching. Our group had been studying two closely related questions: what causes it and how do you prevent it? It is important to note that in many cases, the luminescence lifetime of the particles does not change. The only thing that changes as the particles are heated is that an increasing fraction become “dark”. These particles do not emit at all. This is referred to a “static” thermal quenching. The most obvious possible mechanism is that the particles undergo a structural change, specifically reversible loss of surface ligands, as depicted below. However, we have shown that this is NOT the dominant mechanism, at least below about 80 C. In the absence of ligands in solution (typically octadecylamine and tributyl phosphine) this results in only irreversible quenching. Lattice strain: elastic continuum calculations. where E is Young’s modulus and n is Poisson’s ratio. 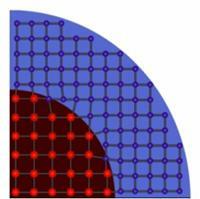 where e is the ratio of lattice parameters and d is the ratio of shell thickness to core radius. The core is under hydrostatic pressure. The shell is under radial pressure and tangential tension. The core pressures are very large, and can be more than 109 Pa. The surface energy is difficult to quantify, but is taken to be proportional to the surface area. Elastic continuum theory allow the calculation of the elastic strains in core/shell particles. 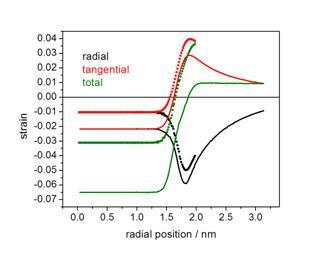 An example of the position-dependent radial and tangential strain in a CdTe/CdSe nanocrystal is given here. We have shown that static thermal quenching is due to a particle charging mechanism in which a valence band electron is promoted to an empty surface orbital. Following photon absorption, the resulting positively charged particle has a “trion” two holes and one electron. The trions undergo a very fast, nonradiative Auger process, resulting in the charged particle being dark. This is depicted schematically below. The extent of thermal excitation of an electrons to a surface orbitals depends on the surface chemistry of the particles, and hence the ligands. We find that alkyl phosphines effectively passivate these orbitals, but alkyl amines do not. This can be understood in terms of the energetics of the molecular orbitals, as depicted below. 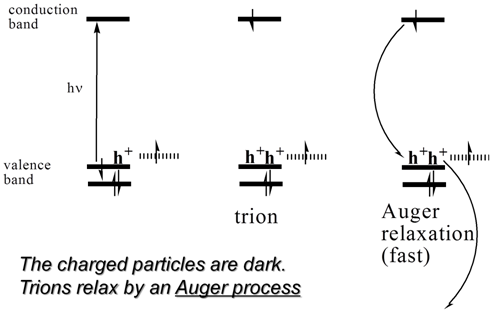 Trions undergo Auger recombination sufficiently rapidly as to render the particle effectively dark. However, the trion dynamics can be studied using ultrafast transient absorption spectroscopy. 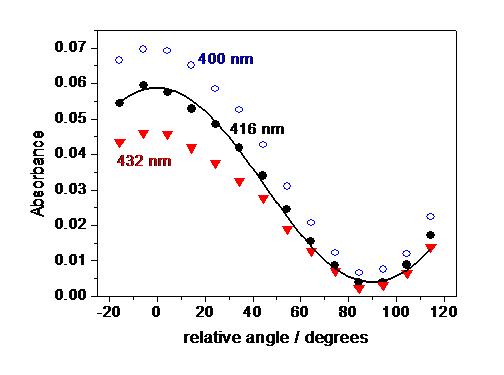 An example of static and transient absorption spectra are shown below (left), and transient absorption kinetics obtained at 582 nm (right). 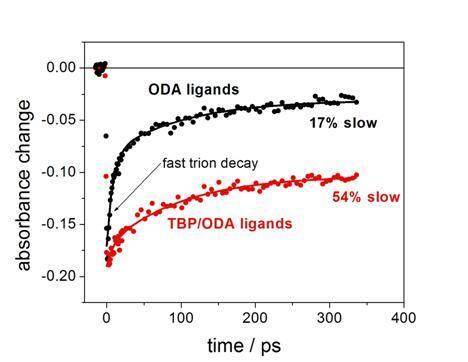 The presence of tributyl phosphine (TBP) and octadecyl amine (ODA) ligands results in less trion formation the having only ODA ligands. Many types of semiconductors have properties which are particle size dependent. Semiconductor nanoparticles are particles which are sufficiently small that their physical and chemical properties are very different from those of bulk materials, and are dominated by quantum mechanical effects, so-called "quantum confinement". These particles are thus often referred to as "quantum dots." We have been interested in semiconductor nanoparticles because of their possible applications in regenerative photocells, photocatalysis and in electroluminescent devices. Development of quantum dots for all of these potential applications requires that we understand their size-dependent spectroscopy and photophysics. We have been primarily interested in the extremely photostable, two dimensional metal dichalcogenide semiconductors, such as GaSe and InSe. 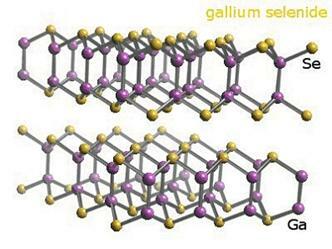 The crystal structure of bulk GaSe is shown below. GaSe nanoparticles consist of "single tetra-layers", i.e., a single sheet of covalently bound Se-Ga-Ga-Se. These particles have diameters ranging from 2.5 to 10 nm and single sizes can be produced by controlling the synthetic chemical environment, or by chromatographic separation. We have put GaSe nanoparticles in organic liquid crystals. GaSe nanoparticles are able to form a hybrid organic/semiconductor liquid crystal with the smectic-A phase of 4-octyl, 4’-cyano biphenyl, 8CB. This is a common liquid crystal molecule , and the phases of 8CB are shown below. 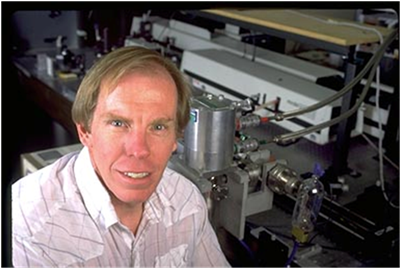 Incorporation of GaSe nanoparticles into the liquid crystal results in almost complete alignment of the particles – the particle’s normal line up with the liquid crystal director axis. This is seen from static polarized absorption measurements, below. The “order parameter” (0 = random orientations, 1= completely ordered) for these particles is about 0.96.
and 432 nm (solid red triangles) are shown. Also shown is a sine squared fit to the 416 nm absorbances. Thus, the particles form well-ordered one-dimensional arrays in the liquid crystal host – the disk-like particles stack like Frisbees or dinner plates. 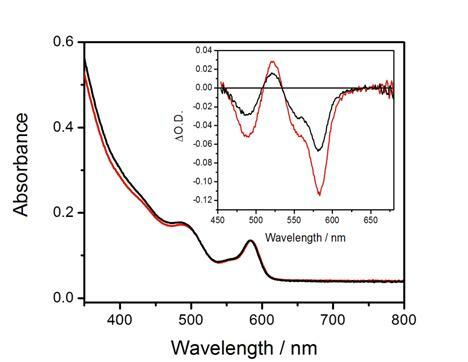 The lack of disorder greatly increases the extent of particle-particle interactions, and fluorescence from these nanoparticle arrays is shifted about 50 nm to the red of that from solution phase GaSe nanoparticles. Time resolved results indicate that the excitons travel large distances, at least microns!